We're planning a 36 day Evergreen Tours holiday in Western Canada (BC/Alberta; Rockies), Alaska (Inside Passage cruise), Maine Maritimes/Eastern Canada cruise, plus US/Canada land content (NYC, Boston, Toronto, Niagara Falls, Montreal etc) for 2019. The earliest departure date from Australia is late April, and the latest is early September. The cost for the latest departure is about 15% more than the earliest. This (provisionally - my research is in very early stages) seems to be simply because of early autumnal foliage displays in the US/Canada East coast areas in early October. IF this is the only difference, can anyone who is familiar with/lives in, or near, any of these locations please venture any opinion regarding the early or late departures? Finances permitting, since the tour ends in NYC (2 days there), we're thinking of spending extra time there afterwards (independently) before flying home, which we can do without paying any additional penalty for our flights back to Oz. I realise it will be quite hot and humid in what will be June, but I'm sure a week or so in NYC could be occupied in a thousand ways - just like I'd love a week (at least) in London, if I ever get back to England again... 3 days there last time was not nearly enough. Last edited by Aussie Seahawk on Sun Jun 24, 2018 12:09 am, edited 1 time in total. I can't answer any of your questions since the only place in that list I've been is Upstate New York in September a few years ago (Schenectady area). But I *can* bump your question back to the top! The weather is a consideration, it is going to be chilly in April, the only plus to that is there is a "slight" chance you could see the Aurora if that is of interest. I would safely guesstimate the weather will be dicey until maybe July? September things might start going back to the colder side. One last thing to consider is if you catch the end of the cruise season you might get better deals on big ticket items like jewelry since most vendors want to get out of dodge with as much profit as possible. Not sure this is helpful but it might be things to consider. If you decide to check out the fall foliage in upstate NY, I recommend heading to the high peaks area of the Adirondacks. You can drive almost to the top of Whiteface (then walk the final 500'). There are plenty of websites that track the foliage. m0ng0 wrote: The weather is a consideration, it is going to be chilly in April, the only plus to that is there is a "slight" chance you could see the Aurora if that is of interest. I would safely guesstimate the weather will be dicey until maybe July? September things might start going back to the colder side. One last thing to consider is if you catch the end of the cruise season you might get better deals on big ticket items like jewelry since most vendors want to get out of dodge with as much profit as possible. Not sure this is helpful but it might be things to consider. Thank you very much for your reply! To see the Aurora would be absolutely wonderful+++! I did not know there was any chance of seeing it so late into spring, although I realise spring comes slowly and late at those latitudes. We would actually not be in Skagway and Glacier Bay (northernmost visits) until May 7-8, as our BC/Alberta land content is first (I explained things poorly, sorry), so maybe that would be too late for the Aurora? Weather-wise, it is certainly a narrow window indeed! We're not interested in purchases of jewelry or anything (but thanks anyway). We're thinking the extra expense is perhaps not worth it, for the later (September) start of the trip. I'm actually partially colour-blind, but the autumn foliage display in Washington, when I went from Seattle to Mt Rainier (late October) was simply stunning. I mean... I can SEE colours, sort-of, I think (I've never known anything else!) but just can't put names to them, unless they are utterly "shrieking" (ie post-box red, sky blue, grass green). Also, after last year, I vowed never to be away from Adelaide again, during the local football finals games (September)! As I've babbled elsewhere on .Net, my team won the Premiership (back to back, too!) and it absolutely killed me I missed it because I was away... not that I expect any sympathy! It's actually something I loathe mentioning when it is a possible reality (for ridiculous but intense superstitious "not-counting-chickens" reasons). Finally booked an 18 day Evergreen Tours holiday a few days ago; going to Western Canada (BC/Alberta, Rockies rail/road trip), Alaska (Inside Passage cruise), and then to New York City for a week on our own. Decided the Eastern Canada/Maine Maritimes cruise also included in a proposed longer trip was too expensive. We arrive in Vancouver a couple of days before the Rocky Mountaineer rail trip to Banff begins, so we can see some of the sights there. I'm so excited to be going! I've always wanted to do this trip. For many years I had a National Geographic poster map of Manhattan on the wall by my desk at work, and spent far too much time looking at it. The serviced apartments we're staying at (Radio City) are very expensive, but just south of Central Park in May, totally expected! I imagine NYC will be a bit intimidating, but we've been to London and Paris independently, and I'm thinking that Manhattan being a giant grid should help a bit. Aussie Seahawk wrote: Finally booked an 18 day Evergreen Tours holiday a few days ago; going to Western Canada (BC/Alberta, Rockies rail/road trip), Alaska (Inside Passage cruise), and then to New York City for a week on our own. Decided the Eastern Canada/Maine Maritimes cruise also included in a proposed longer trip was too expensive. I’ve been to most of the places your planning on seeing, and wish I could make a trip like that now that I’m older and see things in a more mature kind of way. Back in the day I was following the rodeo circuit and was too busy to “smell the roses”. While you’re in the area of Banff, if you have the opportunity DO NOT miss seeing Lake Louise. Its in Banff National Park not far from the town of Banff. I second Banff, AMAZING PLACE !!! What a pic..Look at the size of that bear,not sure those people even saw it pop up under them. That Lake area looks awesome..
That whole area is amazing. I’d put it on a top 10 places in the World list easily. Maybe top 5. Last time I was there it was the middle of December, and it’s hard to pick a season that’s best. 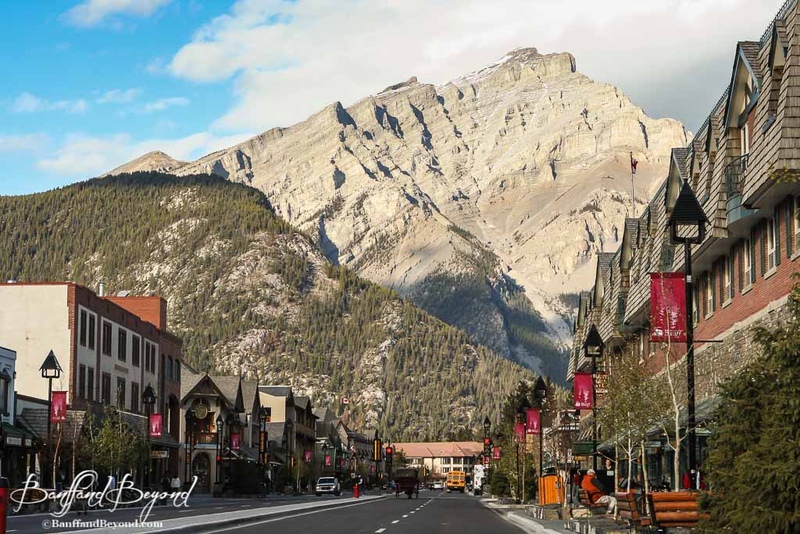 We saw BigHorn sheep and Elk on the sidewalks of Banff. I’m not a beach/tropical kind of guy, so I’m going with Top 5.
pmedic920 wrote: Actually on second thought. Neither are we! We are going to Lake Louise, and we're staying at the hotel (Fairmont Chateau) in the picture. We take the Rocky Mountaineer train from Vancouver, BC to Banff, in a two day trip staying overnight at Kamloops. Then we go by coach to Lake Louise, Jasper, Sun Peaks, Whistler and Victoria. From Vancouver we cruise the Inside Passage, with stops in Juneau, Skagway, Glacier Bay National Park and Ketchikan. Finally we go to New York City on our own for a week, then a very long (transpolar) flight home via Hong Kong. Thanks for the wonderful pictures and wishes for a great trip. Very much looking forward to it! Can I come with? I'll bring my own food and blanket. Banff, Lake Louise, and the whole Bow Valley area are so beautiful. I've been there a few times, and I would love to go back. Victoria BC is awesome too. One of my favorite cities that I've been to. You'll have a great time!